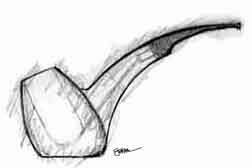 Some months ago, I scribbled out a pipe design I dubbed the "PokerHawk." I was intrigued by the notion of melding a Poker with a Hawkbill, while bringing some of my own aesthetic peculiarities into the mix. I sent the design to a few pipe maker friends, asking if they'd like to have a go at it. One told me all the reasons it couldn't be done. Another said he wanted to think about it for a while before attempting it. One had the courage to go for it right away. While his renditions were very nice, they weren't quite the pipe; they didn't quite capture the spirit, the essence of what I had in my mind. The other day, while talking to Larry, I mentioned the design to him. I emailed him the sketch, and he asked if I'd mind if he gave it a try. Would I mind? What a question! Being such a big fan of Larry's work, I was thrilled with the prospect of his doing something wonderful with what was little more than a conceptual doodle on the back of an envelope. The shape is deceptively challenging. The lines, the curves must be rendered cleanly, continuously, with no abrupt change in the "flow" of the pipe. The half-saddle stem is an important element of the design. It allows a continuity of line, while also providing a visual and physical break. The flow could not be achieved with a tapered stem - the taper would have to be too sharp, ruining the sensuality of the curves. Larry got the "idea" of the pipe right away. He got the feel, the flow. When he sent me a photo of the roughed out pipe, my anticipation was high. When he told me how great the pipe "felt," I knew instantly that he'd do it right. Of course, he had to make some changes; there are, after all, practical matters of physics to consider. The curve of the shank in my sketch is both too long and too narrow to allow the airway to align properly with the tobacco chamber, and to allow for a perfect mortise/tenon alignment. But, this is a sketch, not an engineering drawing. Larry was clearly on the right track. All that was left for me to do was wait. 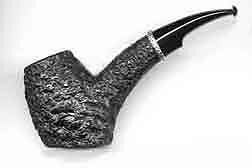 I was beside myself, checking my email frequently, wondering when I'd see a photo of the complete pipe. How would it turn out? Would I love it, or would this end up being just another pipe dream? Would some horrible flaw materialize, rendering the pipe just a fancy bit of tinder? Would Larry decide I was nuts to even envision such a pipe? I picked up the PokerHawk from the Post Office today. It was supposed to be there yesterday, but someone misplaced it, causing me no end of impatient annoyance. But, now I have it. I love it! Pictures do not do it justice! It's even more beautiful than I imagined, and the first bowl is already smouldering away. 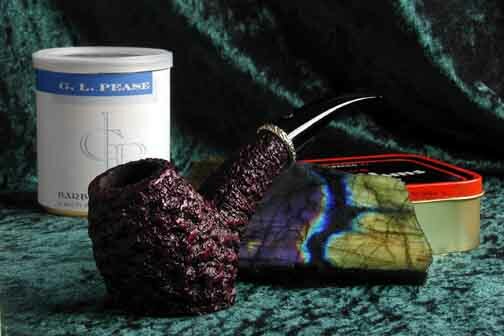 It will be a great smoke, but this is to be expected from Larry's pipes. It's marvelously comfortable, both in the hand and between the teeth. The rustication is beautiful to look at, and delightful to the touch. The stem's fit and finish are superb. The mortise/tenon joint is precise and absolutely perfectly mated; my micrometers indicate nearly ZERO gap between the mortise floor and the tenon's end. A pipe cleaner runs from stem to stern without the slightest hitch. The bowl and airway are expertly drilled, perfectly aligned. This is my third Roush. It will not be my last.